I’ve had a lot of conversations lately about productivity. The conversations have started in a few different ways (e.g., “How can we get the biggest return on marketing?”, “I’m having trouble deciding what to work on.”, “I have too much on my plate.”, etc. 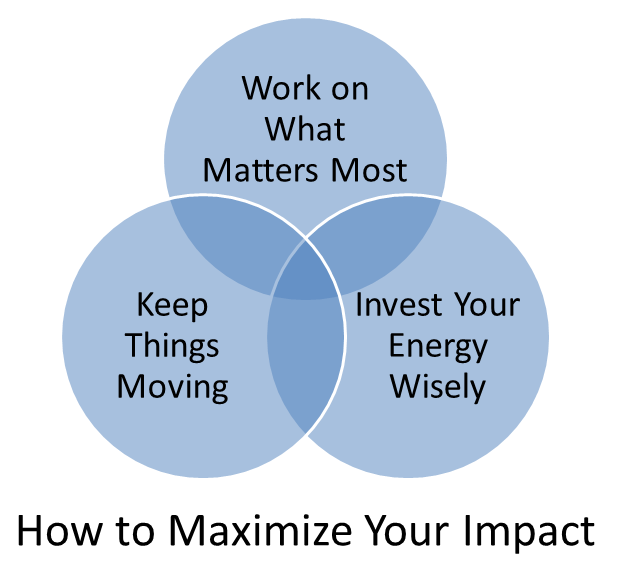 ), but they ultimately all boil down to making the biggest positive impact with a finite set of resources. Unfortunately, when I’m in these conversations I sometimes struggle to deliver what people want; namely, specific strategies and tactics that they can put into practice. Instead, I end up droning on philosophically about “approaches”. I struggle because over the years I’ve just implicitly developed my way of working – it hasn’t been coached, it didn’t come from a book (despite all that I read²) – and there’s no one single trick that I can impart upon others. I must drive people nuts. In this short series, though, I shall attempt to distill my seemingly effective approach into specific strategies and tactics that others can read and apply. Sounds simple enough, right? Well, the devil’s in the details. ¹I at least partially credit/blame the University of Waterloo for drilling me with an overwhelming amount of insanely challenging material for six years. this is a great diagram!